Go long when KST crosses above its signal line from below. Go short when KST crosses below the signal line from above. Martin Pring's KST indicator combines the Rate Of Change Oscillator ("ROC") for four different time periods into one smoothed indicator. The aim is to signal major trend moves on a timely basis while eliminating most of the whipsaws associated with shorter-term oscillators. The KST indicator is primarily used to trade trends and should not be used in a ranging market. 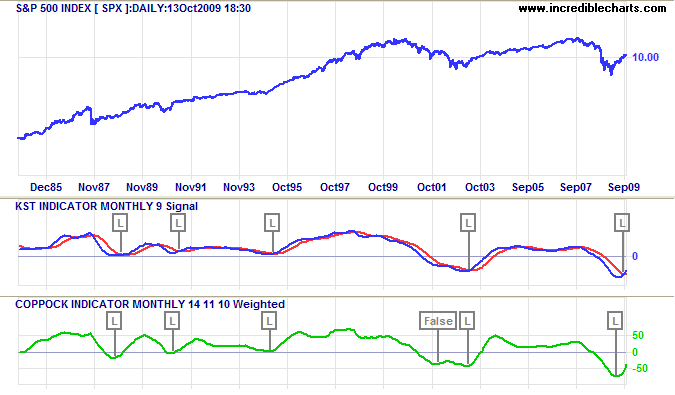 Signals are taken when KST crosses its signal line, calculated as a 9-month simple moving average of KST. First check whether price is trending. If the KST indicator is flat or stays close to the zero line, the market is ranging and signals are unreliable. Signals are strengthened when the signal line also reverses direction. The S&P 500 index is plotted with the KST indicator and 9-month signal line. Go long [L] when KST crosses above the signal line. 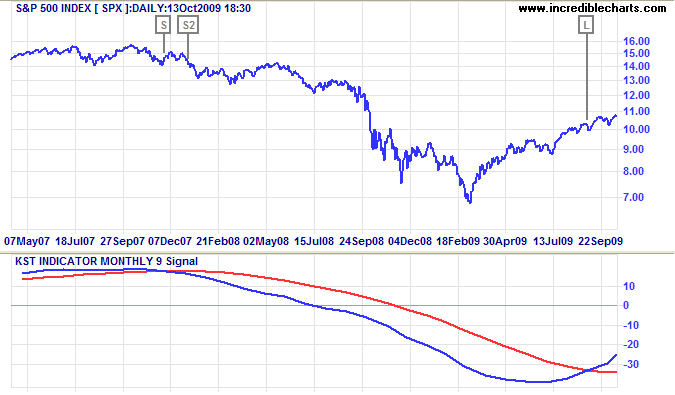 The Signal Line uses a 9-Month Simple Moving Average. Calculate the Rate Of Change indicator for 9, 12, 18, and 24 months. Smooth the first three ROCs with a 6-Month Simple Moving Average. Smooth the 24-Month ROC with a 9-Month Simple Moving Average. Weight the four Smoothed ROCs according to their period. Sum the weighted values to calculate the KST indicator. Calculate the signal line using a 9-Month Simple Moving Average of KST. I find that the KST suffers from the same failing as most trend-following indicators: it whipsaws too often, especially in an up-trend. Comparing trend start signals to the long-term Coppock Indicator on the S&P 500 index for the last 25 years, KST reacts slower, but avoids the false signal late 2001 when Coppock turns up while below the zero line.